Where do you start on a boat of this calibre? These 58 battleships are well known to the serious offshore boater offering style elegance and a shape and quality that never goes out of style. If your are in the market for a boat in the 58 to 65 foot range it goes without saying that this Riviera 58 Enclosed Fly Bridge is a must to inspect. Once the flagship of the Riviera fleet this 58 Enclosed fly bridge would hold it's own in any marina the world over. Presenting in immaculate condition and with a host of recent works only the most committed owner would undertake this is a boat the most discerning family would be more than happy to call their own. A high volume boat with room for the entire extended family to find their own private space this will take you to the Abrolhos Islands, the Montebellos and onwards to the Kimberly with ease thanks to a combined fuel load of 6000lts, water making facilities to around 200lts and hour, twin gensets, ample refrigeration and luxury appointments throughout. 4 cabin, 3 with ensuites sleeping 9 pax in beds. Please browse the attached images for further confirmation of the overall condition of this Riviera 58 Enclosed Fly Bridge. The R Marine Mandurah team look forward to making a suitable time for you to view this outstanding Riviera. 10's of thousands spent by a fastidious owner. 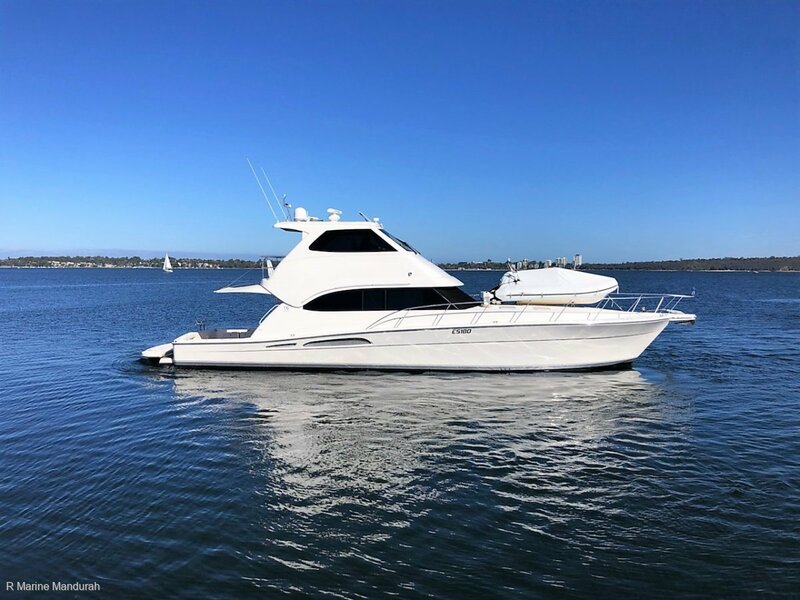 Call the office on 08 9583 5355 or Paul Denboer on 0427 949 293 we are here to help and will be happy to arrange a suitable time view this unique boat in the Australian market. 1400 hp per side !! 34-36 knots - Yes 36++ knots clean ! !